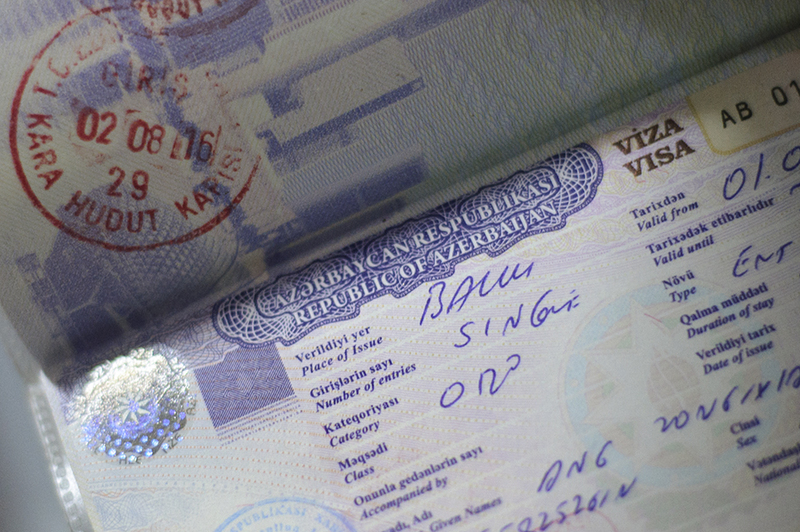 Since 1st February 2016, Singaporeans have been eligible to obtain a visa on arrival at all international airports in Azerbaijan. 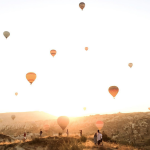 This saves us the hassle of applying for a tourist visa beforehand if we want to visit Azerbaijan—a country located far off the beaten path, sandwiched between Russia and Iran on the western shore of the Caspian Sea. The simplified visa procedure, as well as the opportunity to travel a comparatively little-visited country, led me to visit Azerbaijan this July 2016 for twenty days. However, in trying to gather information about travelling in Azerbaijan, I found out that there was not much information in English available online. Upon completing my travels in Azerbaijan, I decided to write this article to outline some information that may be helpful for fellow Singaporean travellers planning to visit the country. 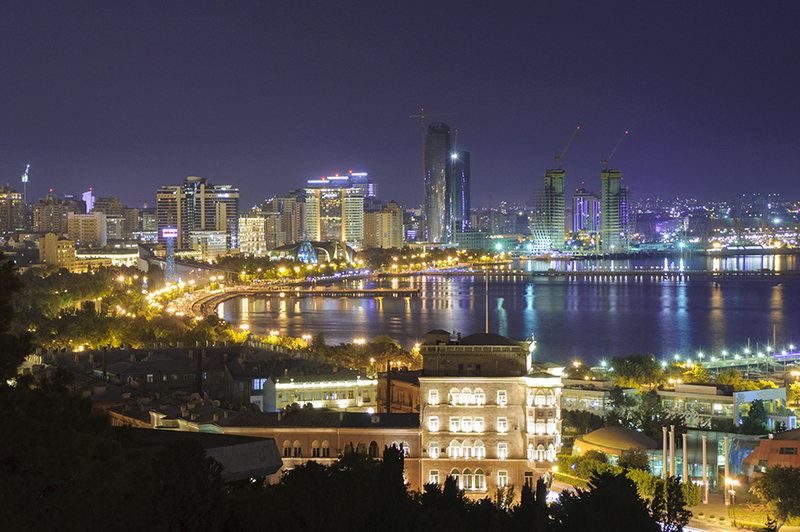 Singaporeans intending to visit Azerbaijan can obtain a visa on arrival at all international airports in Azerbaijan. This visa is single-entry and is valid for 30 days. The visa application cost varies by country. As a Singapore citizen, I had to pay US$50 for my visa. Most international flights into Azerbaijan will arrive in the capital city, Baku, at the sparkling and futuristic-looking Heydar Aliyev International Airport. However, Turkish Airlines has flights from Istanbul to Nakhichevan and Ganja, while Pegasus Airlines has a flight from London to Qabala via Istanbul. As the airports in Nakhichevan, Ganja, and Qabala are considered international airports, you can obtain a visa on arrival in these three cities too. Do take note that due to the Nagorno-Karabakh conflict, if you have visited Nagorno-Karabakh via Armenia in the past, you will be barred from entering Azerbaijan. For those of you who have no idea where Nagorno-Karabakh is, it is a region in Azerbaijan populated mainly by ethnic Armenians. 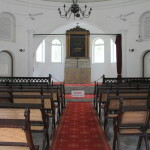 The conflict there emerged after the dissolution of the Soviet Union in 1991, when the ethnic Armenian majority in Nagorno-Karabakh declared independence from Azerbaijan. This led to a war between Azerbaijan and Armenia, which supported Nagorno-Karabakh. Under Russian influence, a ceasefire was signed in 1994, leaving Nagorno-Karabakh as de facto independent. Nevertheless, the UN continues to recognise Nagorno-Karabakh as part of Azerbaijan. This conflict over the status of Nagorno-Karabakh continues to be a highly contentious one in Azerbaijan, Armenia and Nagorno-Karabakh. Be mindful of this if you wish to discuss history with the people you meet while travelling in Azerbaijan. The currency used in Azerbaijan is the manat (AZN). One manat can be further subdivided into 100 qəpiq. As of writing, the exchange rate is 1 SGD to 1.20 AZN. Nevertheless, you should bring US dollars or euros to exchange for manats while in Azerbaijan, given that there is virtually nowhere outside of the country that offers currency exchange with the manat. If your bank does not charge a commission for overseas cash withdrawal, you could also obtain your manats directly from the ATM, which can be easily found throughout all major cities. This was how I obtained my manats while in the country. For your immediate cash needs upon arrival in Azerbaijan, the Heydar Aliyev International Airport has a money-changer and ATM machines. I would expect the other international airports to have these facilities too. The official language in Azerbaijan is Azerbaijani, a Turkic language that shares a high degree of mutual intelligibility with the Turkish language spoken in Turkey. That said, the language of choice for the elites in the country is Russian, a legacy of Tsarist Russian and Soviet rule in the 19th and 20th centuries respectively. From my experience, English is rarely spoken in Azerbaijan, especially outside of Baku. As such, it will save you a lot of hassle if you get yourself an Azerbaijani, Turkish, or Russian phrasebook before visiting the country. Although Google Translator does not have an offline pack for Azerbaijani, I used this Android app which is essentially an Azerbaijani-English dictionary that works offline. Azerbaijani is phonetic and currently uses the Latin alphabet, which makes it significantly easier to read signs and to verbalise what they say. However, there are a number of letters not found in English, or pronounced differently. Some of the significant differences are ə (short ‘a’ as in apple), c (‘j’ as in ‘Jack’), ç (‘ch’ as in ‘child’), ş (‘sh’ as in ‘shine’), ı (‘uh’ as in ‘dirt’), q (‘g’ as in ‘get’), and x (‘kh’ as in ‘Loch’). You could refer to this website for the full list of letters in the Azerbaijani alphabet complete with sound clips for their pronunciations. If you want to stay in Azerbaijan for more than 10 days, registration with the State Migration Service (Dövlət Miqrasiya Xidməti) is required. This is extremely important as according to Lonely Planet, failure to register may lead to a hefty fine of around 300-400 manats. Another possible consequence is deportation: I met a Russian couple in the city of Sheki who were forced to leave the country after their failure to register was discovered. According to the State Migration Service’s website, there are three ways to register. The first is directly through their website (click on ‘Electron Service’ on the left menu bar and then ‘Registration upon place of stay’). The second is via email (download the registration form from the State Migration Service’s website under ‘Required Documents’ on the left menu bar, get help to translate it before filling it up, and then email it to qeydiyyat@migration.gov.az with a scan of your passport and visa). If you stay at a decent hotel, they should be willing to help you register via email. The third way to register is to do so in person at a regional Migration Office (full list here). 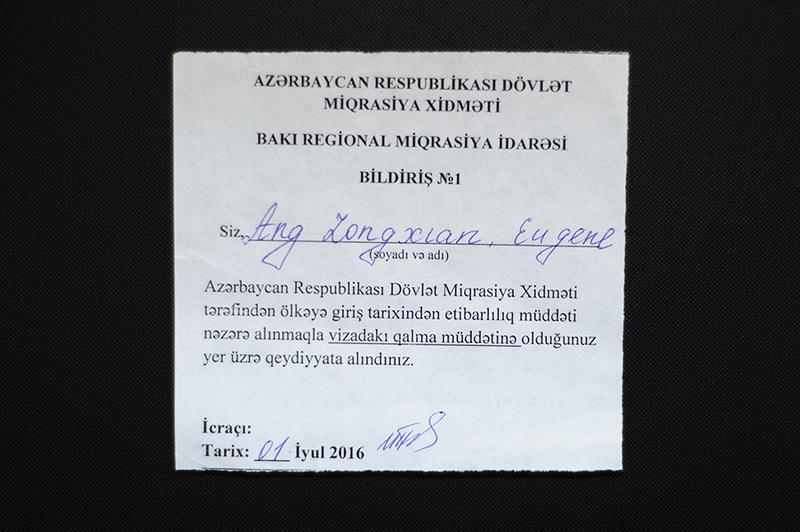 I was forced to register in this manner as the budget hotel I stayed at in Baku said that the Migration Service’s electronic and email system had some problems the week I arrived in Azerbaijan, and thus recommended that I registered in person. If you want to register in person in Baku, the Baku Regional Migration Office’s address is 189 Atatürk Prospekti, just slightly north of the intersection with Ziya Bünyadov Prospekti. I can verify that the Google Maps location of the place is correct and that the place can be easily reached via Bus 2 or 3 (see section on Transportation for how to use the buses in Baku). Entering the Baku Regional Migration Office will be slightly disorienting at first, as no one will come and help you immediately. I showed the counter staff the copy of the registration form that my hotel helped me to fill up, but they just waved me over to the computers to type it directly into a Word document and print it. Once done, head back to the counter and they will photocopy your passport and visa. You should receive a confirmation slip stating that you have registered (take good care of it as you might need it when you leave the country). At this point, the staff tried to ask me for a bribe of 40 qəpiq, but I pretended not to understand their Azerbaijani (I speak Turkish) and they soon motioned for me to leave. Remember that there is not supposed to be a fee for the registration process. 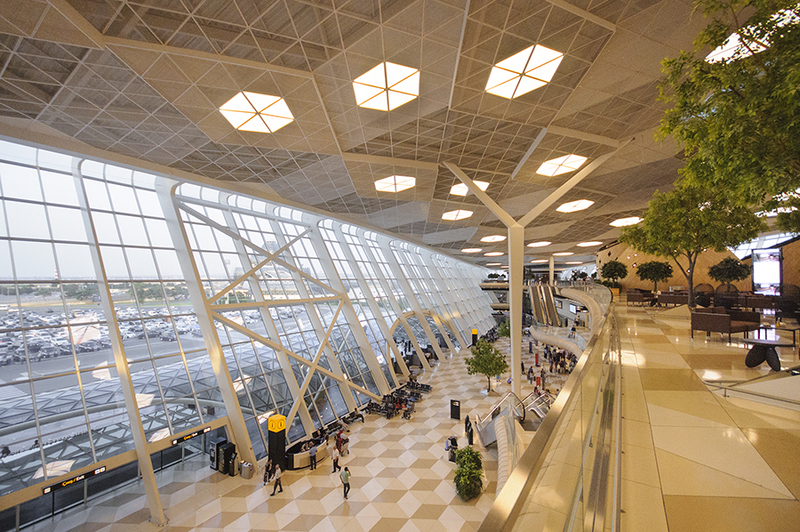 Getting to/from the Baku airport: The comfortable, air-conditioned ‘Airport Express’ bus departs from the entrance of the International Terminal of the Heydar Aliyev International Airport and goes to the 28 May metro station in Baku’s city centre. The bus fare is 1.30 manats, but since you need a BakıKART to get onto the bus, the total cost will be 1.50 manats if you purchase a limited use BakıKART (see following sub-section for more information about the BakıKART). This bus runs for 24 hours, 7 days a week. In general, it departs every 30 mins during the day and every hour at night. When the bus drops you off at the 28 May metro station, there is a signboard near the bus stop that lists out the daily bus departure timings from 28 May to the airport. BakıKART: In order to use the public transportation system in Baku, the BakıKART is necessary. There are two types of the card: the BakıKART plastic card, and the BakıKART limited use (paper) card. Your decision to purchase whichever card should depend on how long you stay in Baku and by extension, how often you intend to use its public transportation system. 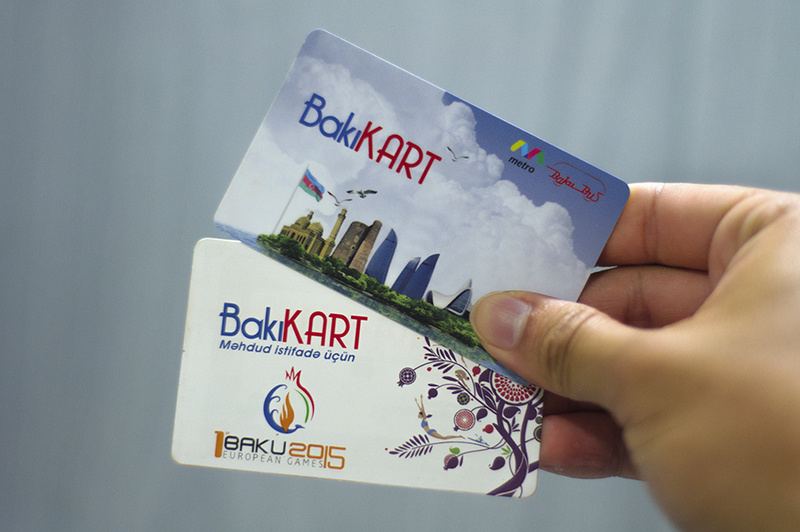 The BakıKART plastic card functions exactly like our EZ-Link card. You simply tap on the card reader to enter the metro or board a bus, but there is no need to tap out as the fares in Baku are fixed at 20 qəpiq and are not distance-based. The cost of the plastic card is 2 manats and you can purchase it, as well as top it up, from the machines at virtually all metro stations. The BakıKART limited use card functions exactly like the plastic card, except that it cannot be topped up. The card costs 20 qəpiq and you can choose between 1-4 rides (20-80 qəpiq) to be loaded into it, i.e. a card with 4 rides will cost 1 manat. You can purchase the limited use card from the machines at the metro stations too (choose the option that says ‘BakıKART məhdud istifadə üçün’). Metro in Baku: Constructed in 1967 during the Soviet period, the Baku Metro features deep ornate underground stations that are common to the metro systems of post-Soviet countries. There are currently two main lines in the Baku Metro, with a third line linking the Memar Əcəmi station with the Avtovağzal station completed just this year. 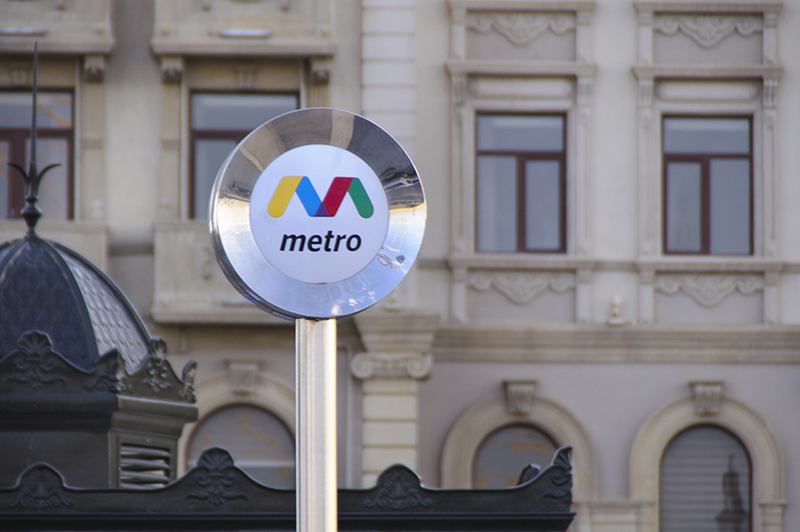 See the Baku Metro’s website for the most updated network map of the metro system. Signs in the metro are in both Azerbaijani and English, as are the on-board announcements for the next station. Display screens at the end of the platforms in the stations will show the terminal station for the next incoming train. In some stations, such as the 28 May station, trains from the green and red lines share a common platform. Pay attention to the display screens to avoid boarding the wrong train. Note that photography is prohibited inside the metro stations, and that there are bag checks to enter all stations. Don’t worry if you are carrying a backpack; the police officer will usually wave you through after opening your bag and maybe taking out just one item. 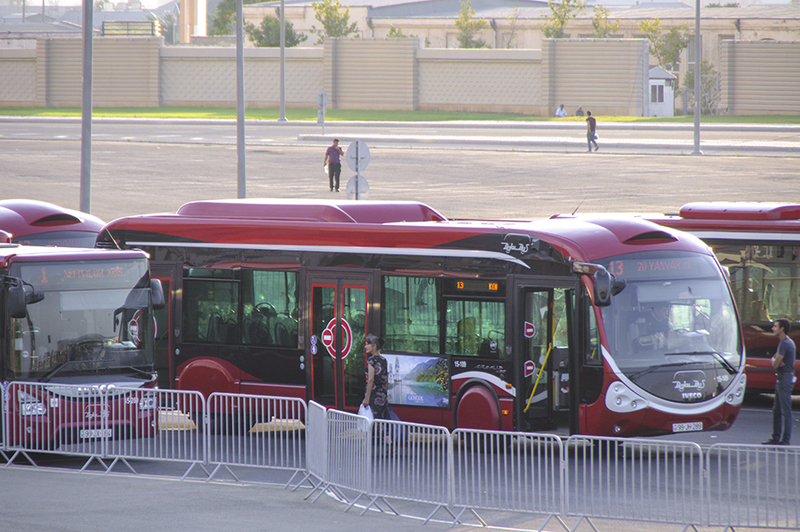 Buses in Baku: There are two types of buses for public transport within Baku. The shiny new BakuBus has an unmistakable red exterior. These buses only accept the BakıKART and are more spacious and comfortable than the older buses. The BakuBus generally runs routes from the city centre and information about these routes are available on their website. For the older buses, you pay the bus fare (20 qəpiq) only when you get off. These buses tend to run routes on the peripheral areas of the city, as well as to destinations in the rest of the Absheron Peninsula. The Baku Avtovağzal: To get to other cities and towns in Azerbaijan from Baku, you will have to go to the Baku International Bus Station (Bakı Beynəlxalq Avtovağzalı). Thanks to the newly-constructed third metro line, you can now access the bus station by metro (follow the signs marked ‘International Bus Station’ in the Avtovağzal station). There is supposed to be an official ticket office on the first floor of the bus station, but almost everyone I spoke to in Baku buys their tickets directly from the bus drivers on the third floor. Simply take the stairs to the third floor and find the bus marked with the place that you want to go. Buses to the major cities, such as Ganja, Zaqatala, Sheki, Quba, and Lankaran, generally run every hour during the day. There is generally no need to reserve bus tickets for domestic travel, but Lonely Planet recommends buying tickets for longer routes (more than five hours) an hour ahead. There are Turkish and Iranian bus companies on the first floor of the bus station, selling tickets to destinations such as Istanbul, Tabriz, and Tehran. Lonely Planet recommends buying tickets for these destinations two days ahead. Marshrutkas: Marshrutkas are the ubiquitous minivans/minibuses that still constitute the primary mode of transportation in most parts of the former Soviet Union. 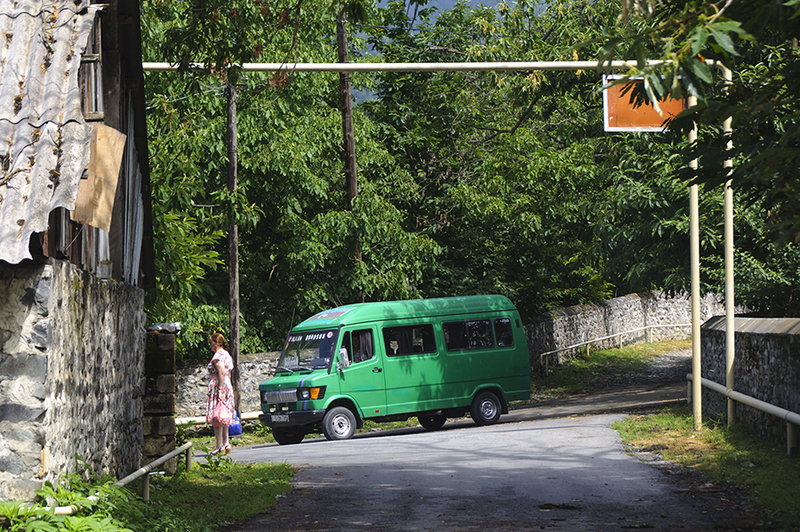 Most of the large cities outside of Baku will have regular, numbered marshrutkas plying fixed routes. For more remote destinations, the marshrutkas will not have numbers and will simply display the places that they will pass through. Like the older buses in Baku, you pay when you alight and the fare is usually 20 qəpiq too. Unlike a regular bus service, however, you can tell the driver to drop you off anywhere along his route. That said, since you would probably not recognize your destination on your first visit, you should tell the driver your destination when you first board the marshrutka. This way, he will probably signal to you when to get off. Getting a SIM card in Azerbaijan was a quick and hassle-free experience. All you need is some manats, your passport, and the address of the place you are staying at. Telephone shops sell SIM cards exclusive to a particular operator, i.e. Azercell, Bakcell, or Nar—their respective logos should be prominently displayed on the storefront. I personally used Azercell, the largest operator in Azerbaijan, and they had coverage everywhere I went in Azerbaijan, including the remote mountain village of Khinalig. Upon entering the shop and asking for a SIM card, the staff will hand you a folder with lists of phone numbers. There will be different types of SIM cards on offer with different services (e.g. data) and prices. If you only need to call and send text messages, ask for the cheapest one. I paid 5 manats for my SIM card, which included 2 manats worth of credits. This is more than enough for a short trip as a text message should cost about 6 qəpiq. Note that you if plan to stay in Azerbaijan for more than 30 days, you will need to register your SIM card. Many restrooms in Azerbaijan have squat toilets and do not come equipped with toilet paper. Hence, I highly recommend packing toilet paper if you want to visit Azerbaijan. Many public restrooms also require a small payment, usually 20 qəpiq. Tap water in Azerbaijan is generally safe to drink, but ask your hotel or host just to be on the safe side. I had no problems with food poisoning while in Azerbaijan, but I avoided buying food from street vendors. 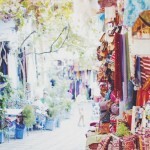 Food is the most expensive in the touristy areas of Baku, i.e. inside the Inner City (İçərişəhər) and the area near Fountain Square. 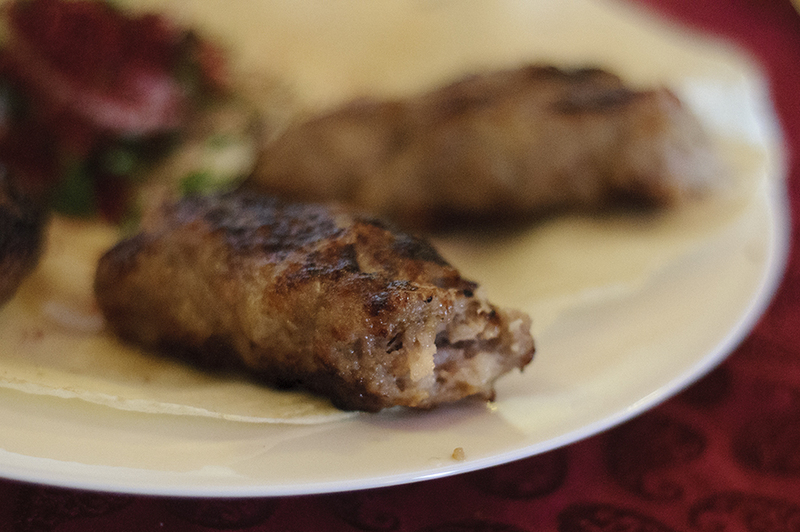 If you want to sample typical Azerbaijani dishes at a cheap yet decent restaurant that is not too far from the city centre, I recommend Bakı Ailəvi Restoran, which is located just two blocks south of the 28 May metro station (address: 28 May küçesi 74a). Do not expect service to be as attentive as what you get at sit-down restaurants in Western countries, but the ambience and food is really good for the price. When I was there, salads cost 1.20 manats, while meat dishes cost 3-5 manats, around half of what you pay at the restaurants in the touristy areas. Azerbaijan is a safe country for foreigners to visit. Violent crime is rare due to the authoritarian nature of the current regime. There is a very visible police presence in the city centre of Baku. Nevertheless, use common sense and watch out for your valuables in crowded areas, such as on the metro and buses. Avoid travelling to the closed border with Armenia, as well as to the areas near Nagorno-Karabakh, due to ongoing hostilities with Armenia concerning the Nagorno-Karabakh conflict. Land mines also remain a threat in these areas. There is free wifi in the International Terminal of the Heydar Aliyev International Airport, but none at the International Bus Station. Many cafes and restaurants in the city centre of Baku have wifi too. One of the best ways to learn about a country is to meet its people. Yet, this might be challenging when visiting a country such as Azerbaijan where English is not widely spoken. Nevertheless, there are still avenues available to facilitate this process. 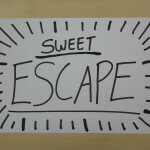 Couchsurfing: I always use Couchsurfing when I visit a new country to meet English-speaking locals. 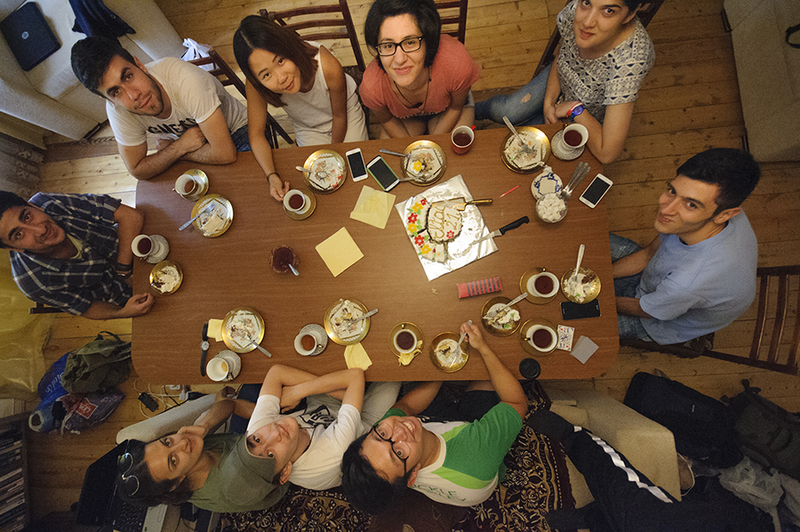 There is a decently-sized community of Couchsurfing users in Baku for you to find a host or just to meet up and hang out with a local. Outside of Baku, however, it might be much more difficult to find an active user. Bag Baku: Bag Baku is a group set up by a local Bakuvian, Sabina, that aims to help foreigners explore Azerbaijan. On most weekends, especially in the summer, Bag Baku organizes day trips leaving from Baku to various parts of Azerbaijan. The price for joining those trips depends on the distance of the destination from Baku, but they generally range from 25-45 manats (expensive for local standards, but way cheaper than conventional tour agencies). Check out their Facebook page to find out about their upcoming events. 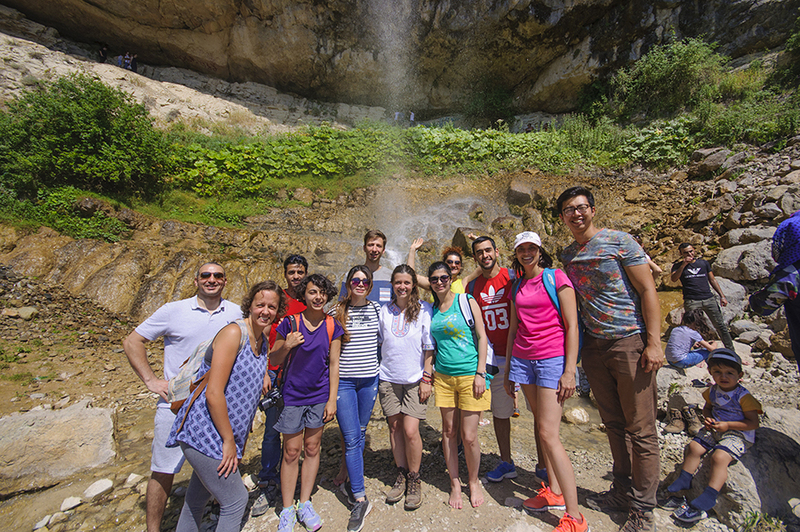 From my experience with one of their trips, most of the participants in Bag Baku’s events seem to be expats, but some locals join their events too. Camping Azerbaijan: If you are interested in hiking, this Facebook group set up by Cavid Qara should be of interest to you. They organize multi-day hiking trips in northern Azerbaijan leaving from Baku, usually on the weekends. I really wanted to join their trips but I was not able to due to my trip schedule and the fact that they tend to only post their upcoming trips less than a week before the actual trip date. A similar initiative is Adventure.Az, which is more commercial and expensive, but at least they post their trips a little earlier. Baku Walking Tour: I learnt about Ganı’s free Baku walking tour through Couchsurfing. The two-hour tour was interesting and informative, but more importantly, I got the chance to meet Ganı, whose personal drive to uncover offbeat places and unforgotten stories in his own country was extremely impressive. He is the person who taught me the most about Baku and Azerbaijan during my time there. 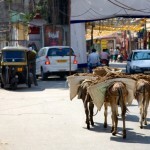 Check out his website which contains some excellent articles about travelling Azerbaijan.